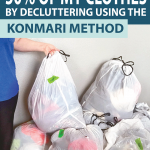 Learn all about decluttering clothes using the KonMari Method. 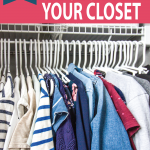 Declutter your closet and organize your wardrobe with these simple tips! I recently decluttered my entire closet and, spoiler alert: I purged MORE THAN 50% of my wardrobe! 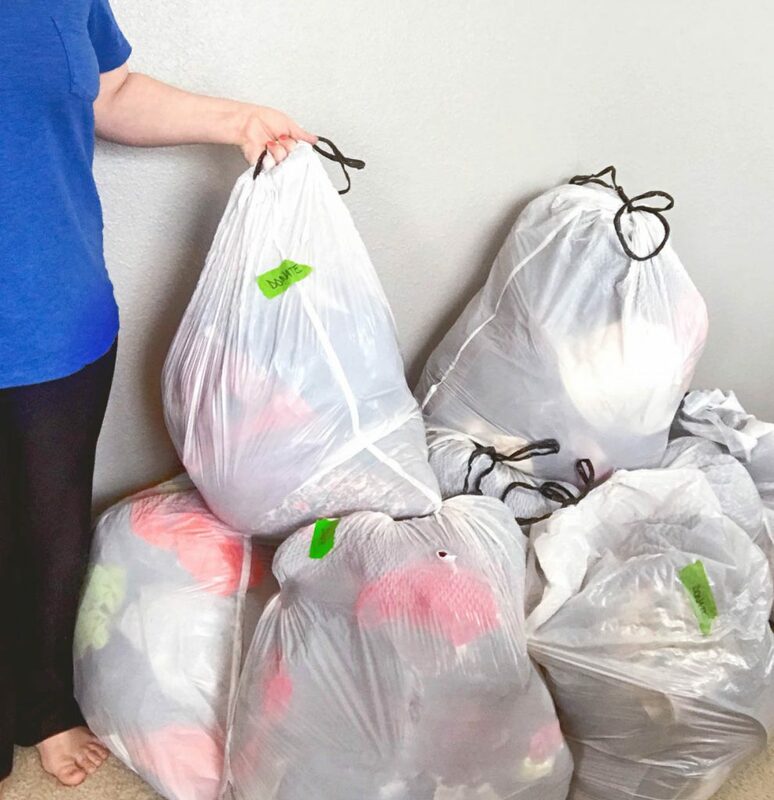 I discarded 8 garbage bags of clothing! 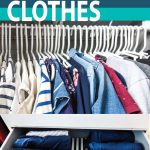 Today we’re talking about tactical tips for decluttering clothes. 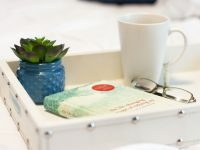 Learn the exact steps to follow to declutter your closet, how to follow Marie Kondo’s tidying process, and questions to ask yourself if you’re having trouble parting with items. I am not a big clothes person but I still manage to accumulate plenty. The last time I did a big closet declutter was when we were moving to this house which was almost 18 months ago. I was very pregnant when we moved and I held onto far too many clothes that I thought I’d wear again “someday”. Granted, I couldn’t fit into anything to try them on but I still should have known better than to keep so many items I hadn’t worn in a year or two. Fast forward 18 months and I was at my wit’s end with my clothes. 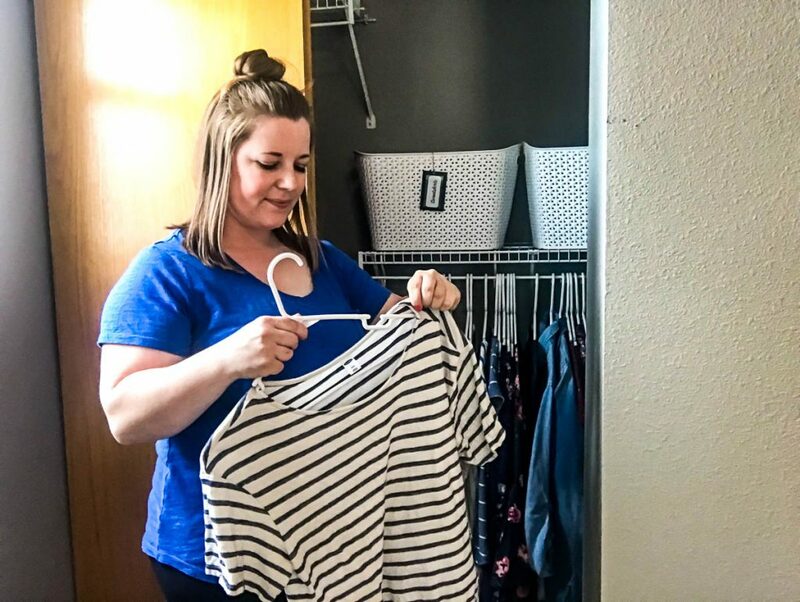 I was only wearing a tiny percentage of the things in my closet, my dresser drawers were overflowing, and getting dressed in the mornings was something I dreaded. I finally turned my frustration into action and completely decluttered my closet following the KonMari method. And it feel ah-mazing! Why did I wait so long?! Ready to jump into KonMari-ing your home? Be sure to download the free checklist! Before we dive into the step-by-step decluttering process, let’s first pause and recognize why we are holding onto clothing that we never ever wear. It’s commonly said that we wear 20% of our wardrobe 80% of the time. 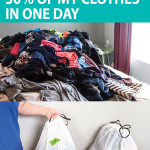 That means 80% of our clothes just sit in our closets collecting dust and taking up space! We want to look different. Body issues are such a big culprit of cluttered closets. Our bodies change over the years yet we hold onto clothes hoping they’ll fit again “someday”. Keeping clothes that are too small for you post-pregnancy or don’t fit you quite right today is pointless. You should love all of your clothes, so get rid of anything that makes you feel bad about yourself! Maybe it’s that expensive dress that you ended up not liking but forgot to return. Or it might be that ugly sweater your crazy aunt gifted you for your birthday. Or perhaps it’s the pencil skirt you feel like you should wear to the office but in reality, you wear comfortable dress pants every day of the week. Don’t let guilt take over your closet! These items make you feel bad every time you see them so do yourself a favor and admit you’ll never wear them, then get them out of the house. We don’t not like it. I feel like this happens to me with shirts I buy during a really good sale. They’re too good of a deal to pass up and they look okay in the store, so I bring them home even though I’m not totally in love with them. And then they hang in my closet never worn. Clothes that you think look okay can be tricky. You like them enough to think you’ll get around to wearing them yet you always choose something else instead. These items are great things to sell or give away. We’re keeping it for “someday”. If you haven’t worn it in the past year (or two years if you’re pregnant), it’s very unlikely you will wear it again. Be honest with yourself. Your style changes, trends change, and your lifestyle changes, too, so there’s really no reason to hold onto unworn clothes that long. If you don’t have a reason to wear it now then there’s no sense in keeping it. We’re trying to be someone we’re not. Sometimes we buy items for a life we wish we lived or to be like someone else. Be honest with yourself about what clothes fit your current lifestyle. Sure, that backless sequin dress may be cute but if you’re a new mom who lives in leggings and goes to bed at 8:30 on Saturday nights then you might not need it. First of all, there’s no right or wrong way to declutter clothes! You’ll feel lighter and less stressed after taking the time to sort through your closet and drawers, discarding some items, and tidying everything. 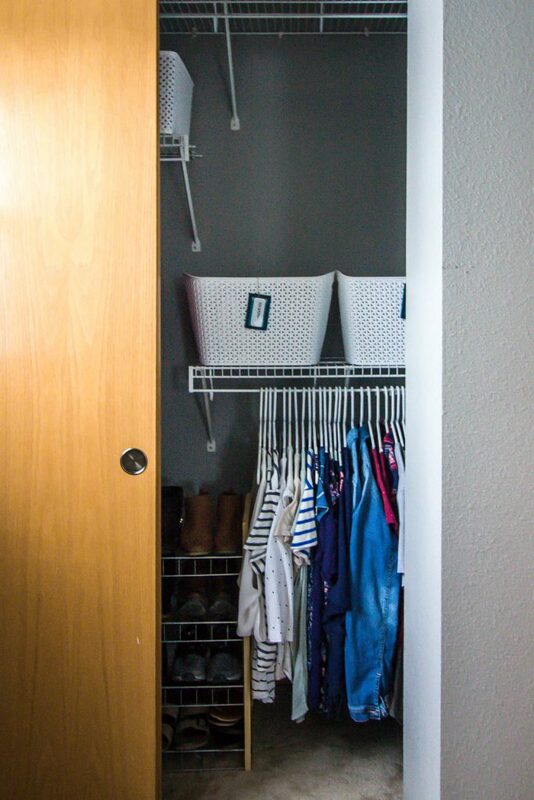 I’m sharing the process I like to follow when decluttering and organizing my closet. Feel free to follow it to a T, alter it if you wish, or completely ignore it and go about it your own way. However you go about it, the end goal is to have a tidy wardrobe that makes you look and feel good! Alright, now for the good stuff! 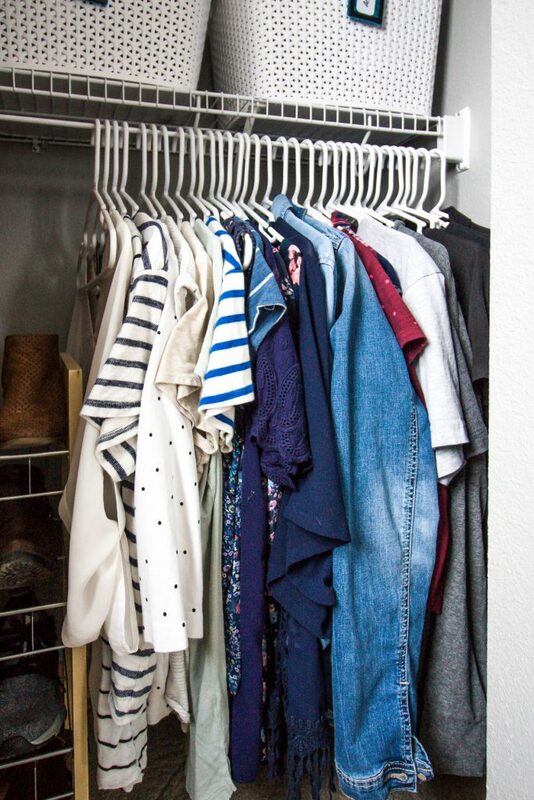 Here are the steps I took to declutter my closet and get rid of HALF OF MY WARDROBE (sorry, I just can’t stop shouting that in all caps because I’m still in disbelief!). FYI I don’t follow the KonMari Method completely, but these steps are generally in line with what Marie Kondo teaches. 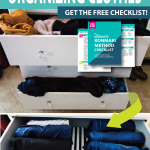 Be sure to snag the free KonMari checklist to use as a decluttering guide! Note: This entire process took me 4 hours. Obviously the time it takes you will depend on your speed and the number of clothes you have to declutter. But my advice is to set aside a full day to work on this project so you can finish it in one sitting. Take a few minutes to prep before you dig into a decluttering project. You will be accumulating piles of clothes to donate or sell so it’s a good idea to set up a designated spot for those to go. 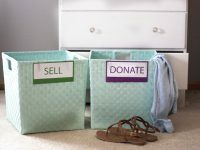 ollect donate and sell items in large trash bags, boxes, or bins. You’ll also want a roll of large trash bags to collect worn out or broken items that can’t be given away. 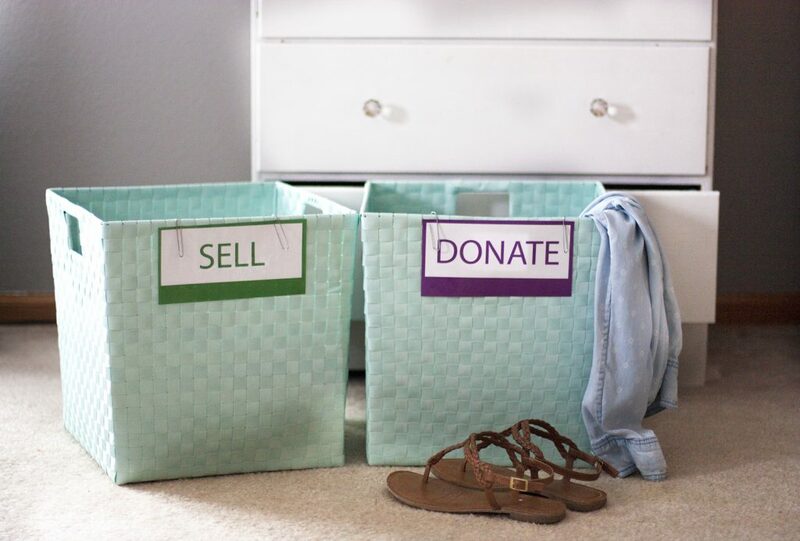 Set up a donation/sell zone near your closet so it’s easy to toss items in the boxes or bags as you’re decluttering. Optional: Add a set of these cute sorting signs to your boxes! Keeping these items contained from the beginning of your project will help you stay organized as you declutter. Note: Have an exit strategy for all of your trash, donate, and sell items. They need to be out of your house asap so be honest with yourself – if you will never actually get around to selling items, then donate those items instead. This step can be a little overwhelming but it’s very necessary! 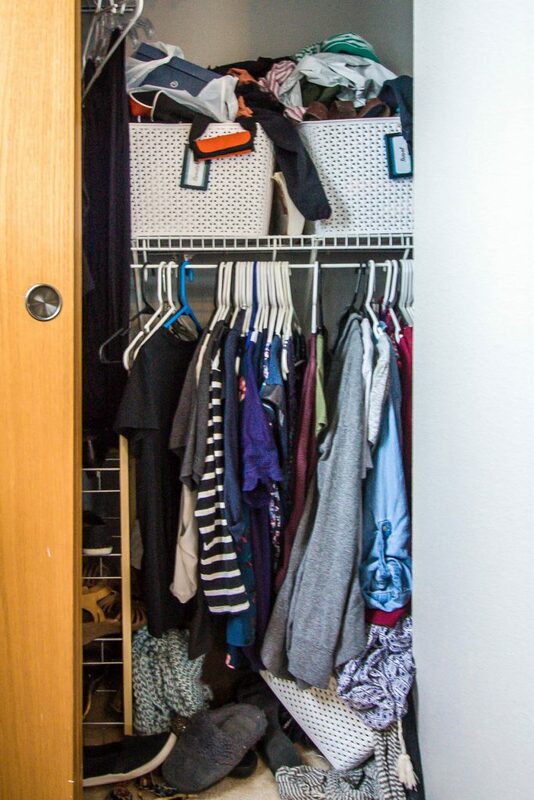 Gather up every single clothing item you own. Piling them on the bed works well. Take everything out of your closet, everything out of your drawers, and then do a sweep of the house and collect other items. Don’t forget coats, shoes, seasonal items, etc. And make sure you grab any of your clothes that are in the laundry, too! 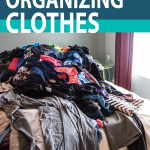 It’s a lot to see that huge mountain of clothing, but it’s really important that you get everything in one place so you can get a true picture of what you own. 3. Sort Through The Pile & Purge! Now it’s time to sort through that pile of clothes and decide what to do with each and every item. This can be very overwhelming but just take it one item at a time. 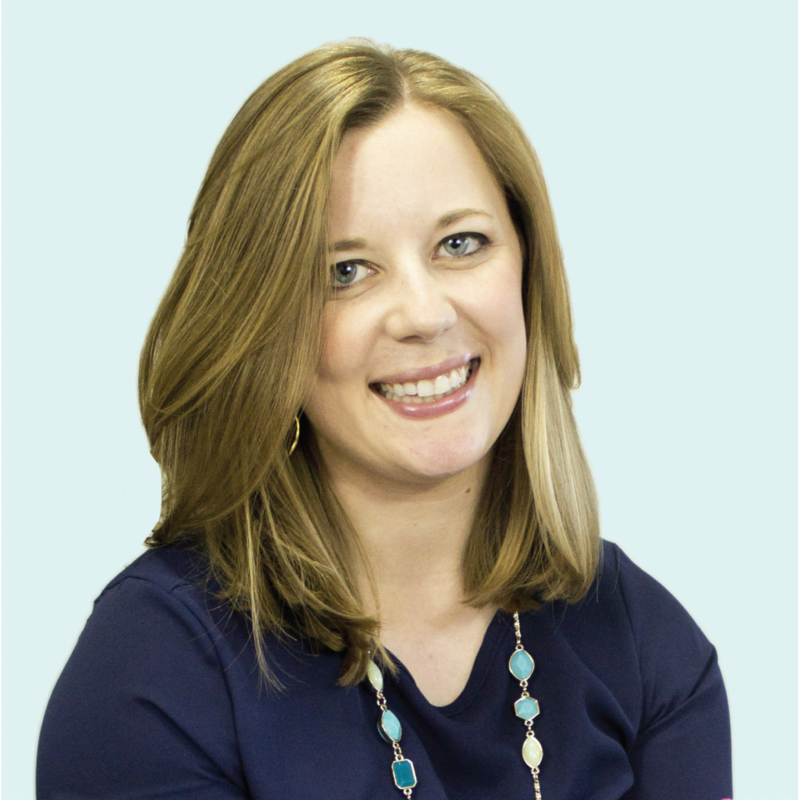 One tip from Marie Kondo’s book that I love is to choose what to keep, not what to discard. 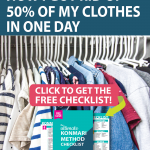 This simple mindset shift really helped me only keep the clothes I truly loved. If I loved it, I kept it. Everything else went straight in one of the discard piles. This step can be tiring but keep pushing forward and make quick decisions. If you don’t immediately love it, there’s no reason to keep it. If you’re considering keeping something you haven’t worn recently, try it on to make sure it actually fits. Do I already have multiples of it? Would I buy it if I saw it in a store today? Do I have places to wear it? Watch for duplicate items and be honest with yourself about how many you really need. I kept three pairs of yoga pants and discarded the other three. I kept the nicest white T-shirt and discarded the others. Be ruthless with bras, socks, and underwear. If they are stretched out or worn out, they need to be tossed. That bra you never wear? Get rid of it. Those socks you’ve had since college? It’s time to replace them. I hate spending money on these items, but it’s really worth it to replace your worn out collection of socks with a new set that’s all the same style. And if you haven’t bought new underwear in a while, it might be time to toss the older pairs and buy yourself some new ones. I filled 8 garbage bags with items to donate and trash! I use painter’s tape and a Sharpie to label the donation bags so I could tell them apart from the garbage. Put your keep items away neatly as you sort instead of piling them up to deal with later. Fold items neatly into drawers or hang them in your closet. Categorize items into different drawers. 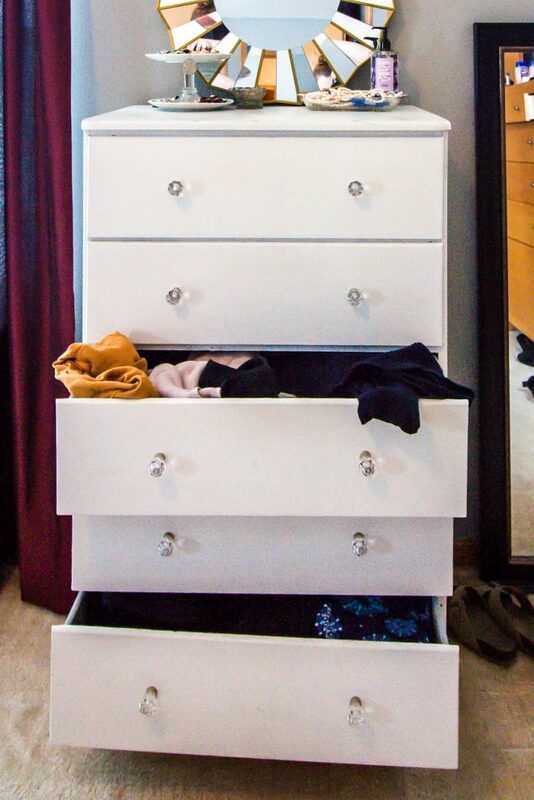 Designate one drawer for shirts, another for pants, and another for socks and underwear. The goal is to keep all of one category together so you can see everything in one place. 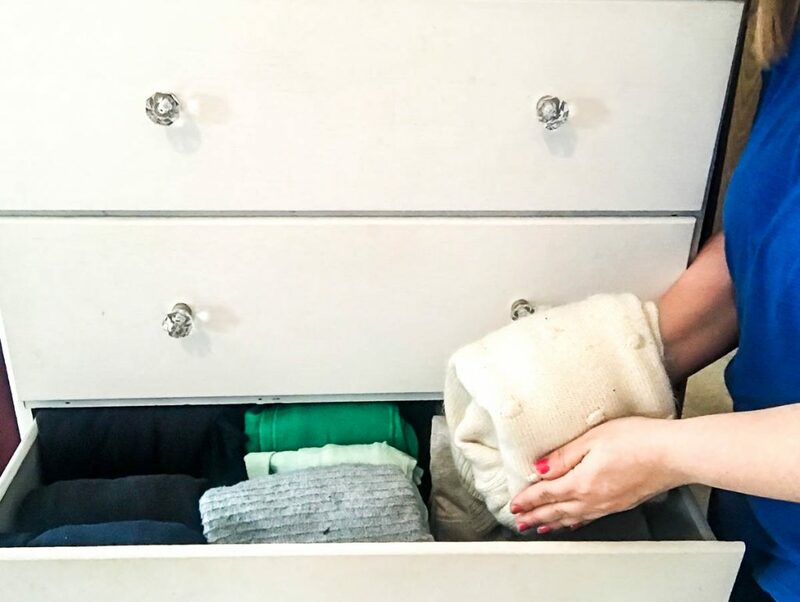 Fold items in drawers using the filing method aka Marie Kondo’s way. 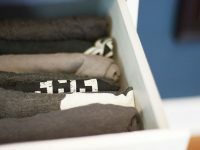 To do this, you fold items into small rectangles and file them front to back in your drawer rather than stacking them. It really does keep everything more organized! 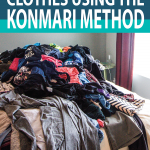 Click here to learn how to fold clothes using the KonMari Method. The exception I made to the filing method are my everyday socks. Instead of folding them up all tiny, I simply stack them. This works well since they’re all the same style and I can easily just grab the top two from the stack. Use drawer dividers to contain small items and divide large drawers. I use a couple of old shoe boxes in my sock and underwear drawer to keep all of those small items compartmentalized. 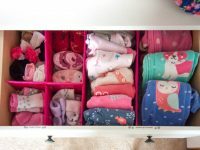 I made DIY drawer dividers out of cardboard to organize baby clothes in Chloe’s dresser. You can purchase drawer dividers or use cardboard boxes, plastic or fabric bins, or strips of cardboard cut to fit the depth of your drawer. 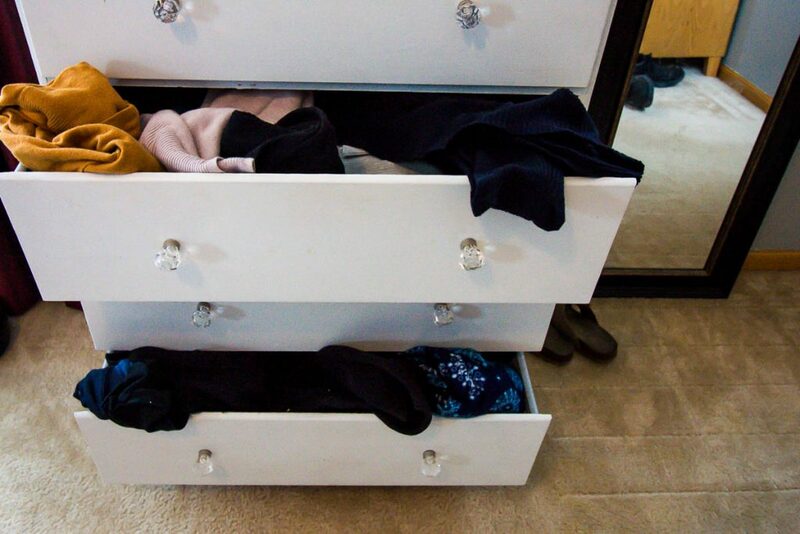 Fold sweaters into drawers. Don’t hang sweaters or you’ll end up with hanger indents and stretched out sweaters. Sweaters are best folded inside a drawer. Color code hanging items. 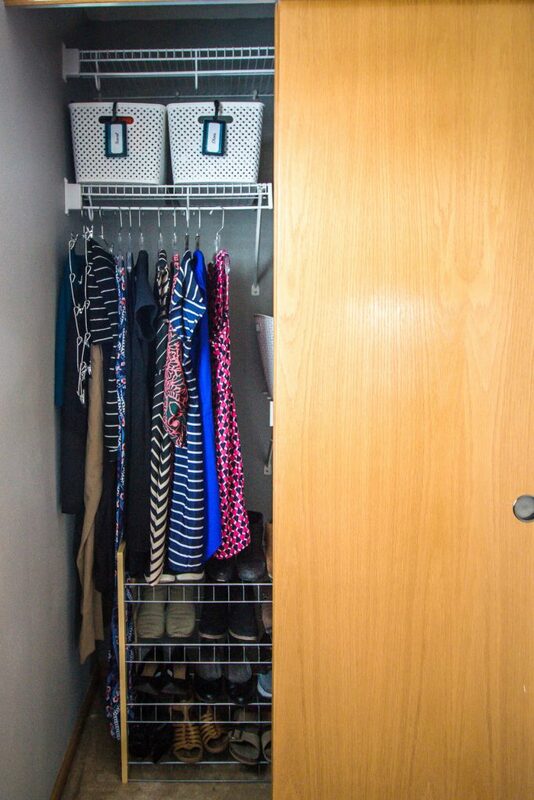 This makes your closet look organized and it’s easy to find specific items. I hang up all of my shirts with the exception of workout shirts, and color coding them is so helpful! Use uniform hangers. 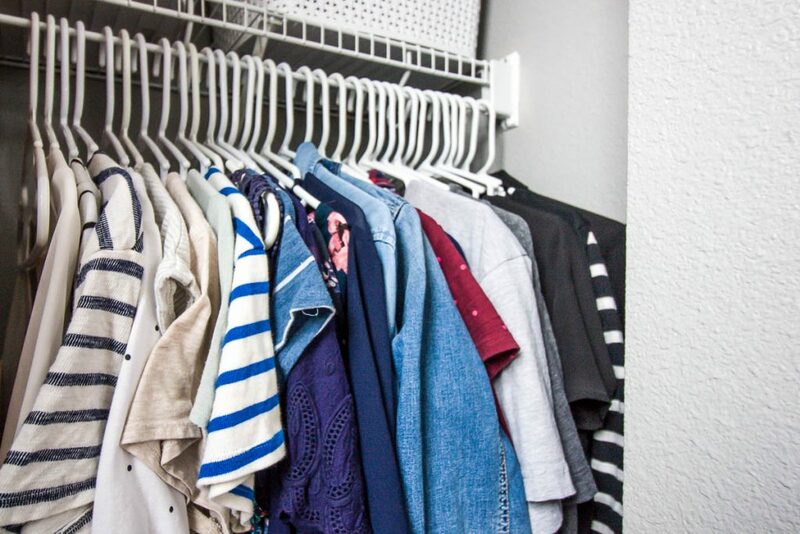 Your closet will instantly look neater if all of your hangers match. You can splurge for those fancy slim velvet hangers or just use all of the same color of the cheap plastic ones like I did. Take advantage of any floor space underneath your hanging clothes. I had enough room in my closet for a small shoe rack. Option 1: Store seasonal clothing high up in your closet. 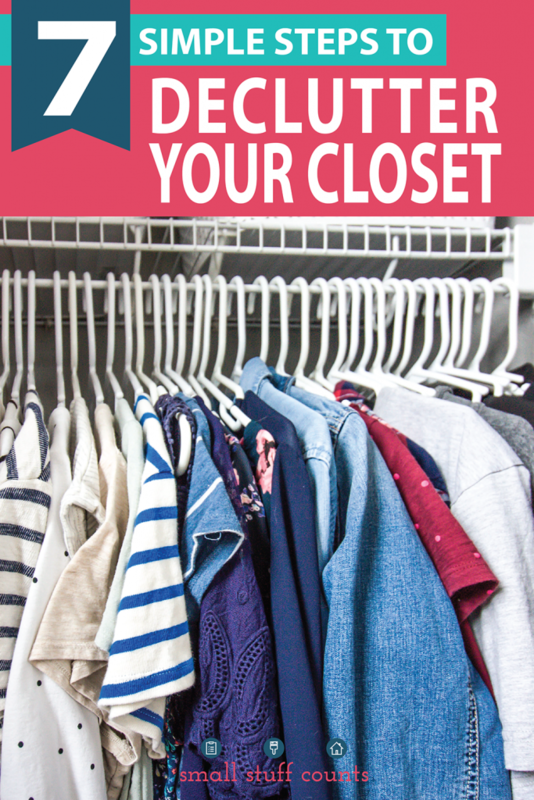 If you have upper closet shelves that you can’t reach, those are a great place to store bins of seasonal clothing. Option 2: Carve out storage space in another area of your house. If there’s no room in your closet, some common storage spaces are under the bed or in the basement. Option 3: Keep all of your clothes together. 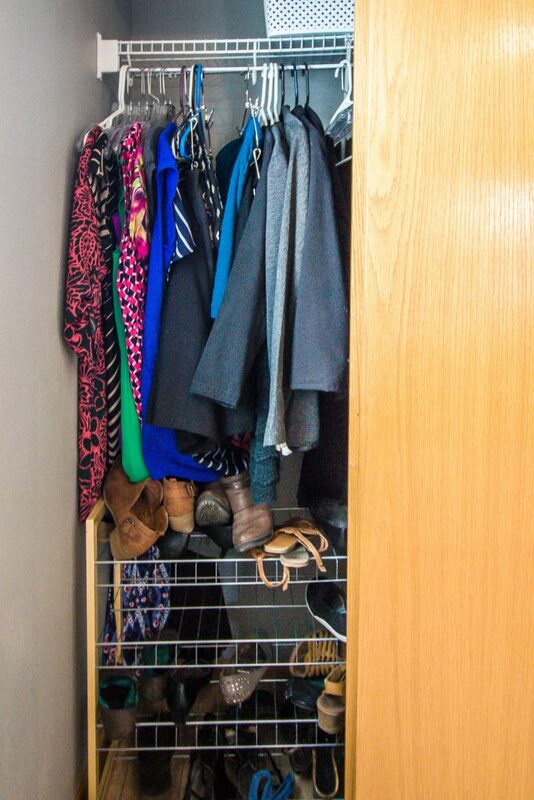 Between my closet and dresser, I have enough space to store all of my clothes in one place. I don’t pack away seasonal items which means one less thing to do as the seasons change! This step is key! 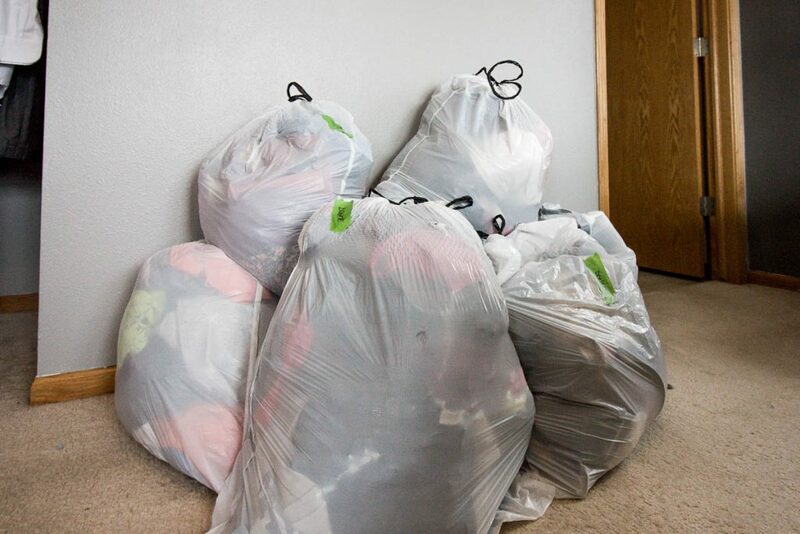 Don’t let your bags and boxes of discard items sit around in your bedroom for weeks. Carry them straight out to the trash, load the donate items into your trunk and drop them off this week, and schedule a time to deal with anything you want to sell. 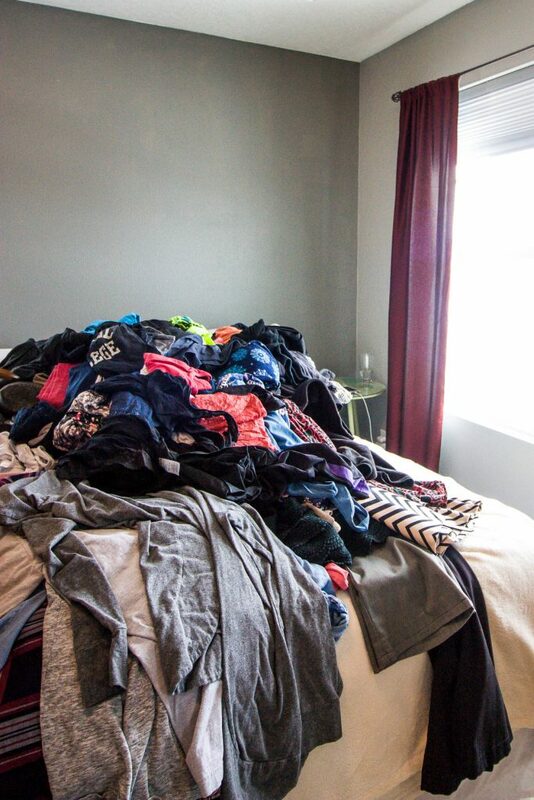 Whew, decluttering your closet is a lot of work! Treat yourself to something for a hard job well done. You might even want to decide on a reward before you begin decluttering if it will motivate you! After working so hard to declutter and organize your clothes, the last thing you want to do is go backwards. I try to be very conscious about maintaining my neatly folded drawers of clothes and keeping my closet color coded. These things make me happy every time I get dressed so it’s worth a little effort to maintain them! I’m also mindful of the new clothes I bring into our house. If I don’t absolutely love it, I don’t buy it. I only purchase new clothes that I love and know I will wear often. Wow, that was a lot of information! 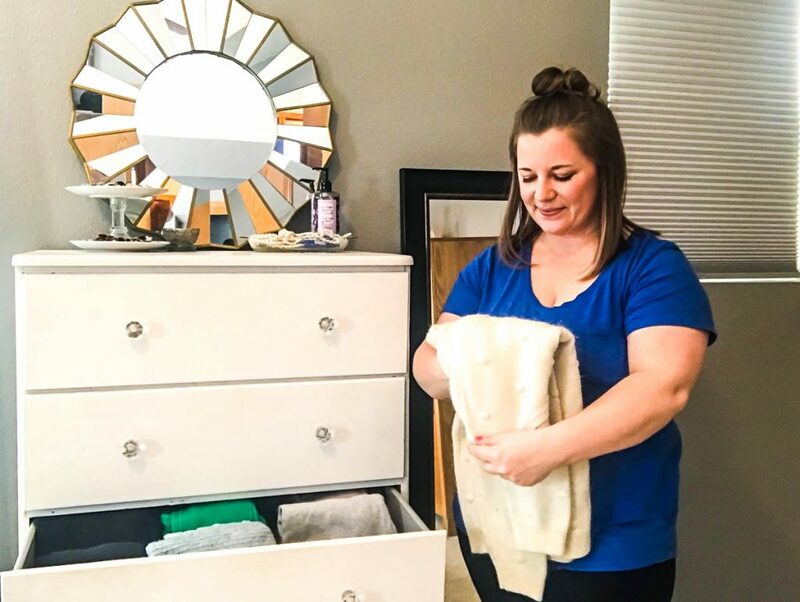 I hope these steps will help you declutter your clothes and experience the joy of a closet filled with items you love and nothing else. 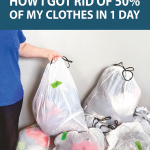 I cannot tell you how amazing it feels to have less than half of the clothes I used to! I no longer feel stress or guilt when I open my closet. Choosing outfits is much easier when every item fits and is something I love. My drawers are no longer overflowing, instead I now have room to spare. If your wardrobe needs decluttering, go ahead and choose a day in the next week or two to make it happen. Crank up the music or turn on a good podcast and commit to following this decluttering process step by step. A few hours later and you’ll have an organized closet that makes you feel light and happy, not stressed and guilty.